I was talking with a friend who recently had a baby. She was telling me about how tight money is for them and how she was spending hundreds of dollars each month on baby clothes, only to have him outgrow them in a couple weeks. This just sounded crazy to me. 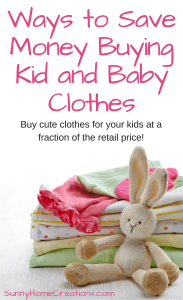 There are so many great places to find gently used clothes really inexpensively, especially for baby clothes! Not only that, but over the years, I have found great ways to save on new clothes that have made them less expensive than used in some cases! Check your area for consignment sales. The Portland/Hillsboro area (in Oregon) has Pass It On, which is especially good for preschoolers and below. It’s been a couple years since I’ve been to this sale, so they might have a larger collection of bigger kid clothes nowadays. When I used to go to this, I could get baby clothes really cheap – for example, I’d find three onesies rubber banded together and priced at $2. There were also expensive name brand clothes that were a lot cheaper than buying it retail at the store. You should be able to find consignment sales fairly easily in larger towns and cities near you. Thred Up is an online used clothes store. They have a large assortment of clothes for good prices. I wish I had known about this place years ago! Once my oldest reached about 5 years old, I had a lot harder time finding clothes for him at consignment sales and such. This would have been a great resource then, but it’s a great place for us to buy clothes for all my kids now. There are a lot of name brand clothes here. I have a friend whose son only wants to wear Nike and Underarmor. Thred Up has a decent selection of these items for a fraction of the cost she was paying new at the store.
. I’ve found the best way to purchase clothes on here for my kids at the best price is to buy them in lots. This means I might be buying several shirts, shorts and pants at the same time all in the same auction. There may be a few pieces in here that my child won’t wear, but the price makes it so I still come out better by purchasing the lot of clothes and donating a few pieces instead of buying them all individually. One way I’ve used this, since there are so many clothes and I find it overwhelming is to look specifically for what my son likes. One of my sons really likes athletic shorts with pockets and mainly the ones from Nike. He doesn’t like them really long and all the ones I could find in stores went past his knees (like basketball shorts), he likes them to hit him at his thighs. He is very particular about how clothes feel on him. I was able to do a search and buy a lot of 3 shorts for about $15. Not the best deal, but a great deal for name brand shorts that my son would wear and be comfortable in. If you can buy a year ahead, many times you can purchase clothes for cheaper than you can get it used. At the end of summer for example, Fred Meyer (Pacific Northwest area) has all their summer clothes on clearance. They end it at I think 75% off the lowest marked price. A lot of the time this means each piece of clothing is under $5. Sometimes the selection isn’t the greatest, but make sure to check it out, because many times you can find at least a few pieces that your child will like for a great price. Also, not all the stores have the same items. So for example, if I am at a Fred Meyer and check out their clearance selection at one location, then happen to be next to another Fred Meyer, often times that Fred Meyer will have a totally different selection of items on clearance. It all depends on what that particular store sold less of. Amazon has a great selection of kids clothes and you can sometimes find kid clothes for a good price. They have brand name and non-brand name clothes. For a while, when my kids were toddlers I would buy their pajamas here. They were super cute, good quality, not a brand name and affordable. My best friend used to text me all her garage sale finds. She would find clothes that looked brand new and were super cute for about 50 cents each. When she was pregnant with her daughter, she went to garage sales the summer before she was born and that little girl had the cutest clothes for the first couple of years that she picked up at garage sales super cheap. I couldn’t believe the bags of clothes she showed me before her daughter was born. She had 10-15 brown paper bags stuffed full of baby clothes. She found these garage sales through Facebook garage sale groups (where people would post garage sales they were having that weekend), Craigslist and stopping by garage sales she would find when out driving around. Not all thrift stores are created equal. It is all dependant on what people bring in to donate. I didn’t have good luck at Goodwill and other thrift stores for a long time. I moved into a small town and the closest larger town has a Goodwill that I checked out a few weeks ago. They had a huge amount of kids clothes – and in larger sizes! Goodwill and other thrift stores seem to tag their merchandise with different colored tags. I think it was at Thrift World where the clothes are purple tagged and one day a week they have purple tags half off. This makes it such a good deal when buying clothes here. Also, check out thrift stores other than Goodwill. Sometimes the smaller ones have a better selection and/or price. Ross, TJ Maxx, Marshalls, etc sometimes have really great deals on clothes. For awhile I was able to buy my son really cute shoes from Stride Rite through these stores for around $10. The other items I like to buy from these stores are underwear and socks. Sometimes I find great deals on these. It pays to not only check out the clothes, but check out the shoes as well. But you need to know your pricing, because although the tags claim to be a ton cheaper compared to retail prices, I’ve found I can sometimes find these items at another store for a lot cheaper. EBates is a great way to save money. You get money back on purchases you make. In order to get money back, you need to sign up with eBates. Then log in and search for the store you want to shop at. Click the link for the store and shop as you normally would. The cash back will go into your eBates account and when it reaches a certain amount ($10) they will mail you a check. You can also add eBates as a browser button and it will remind you to use eBates when you are on a store website that works with eBates. In recent years I’ve been buying some of my son’s jeans/pants through The Children’s Place. I buy the jeans when they are on sale for $7.99/pair and start out by using eBates to get cash back on this purchase. It makes the jeans fairly cheap. There are so many ways to save money when having kids. I hope you found some new ways to save money on kid and baby clothes. Let me know your favorite way of saving money on kid and baby clothes in the comments below! If you liked this, I’d love for you to “PIN IT”!